The quake caused comparatively little damage. The epicentre was deep underground. The epicentre of the 26 October earthquake was around 200 kilometres underground. Despite a 7.7 magnitude the earthquake caused comparatively little damage in all affected countries. The official death toll has risen to at least 360, hundreds of people were injured. The European Union and its Member States must urgently scale up their responses to the refugee crisis in the Middle East and Europe as winter approaches before more lives get lost, five major humanitarian organisations said today. 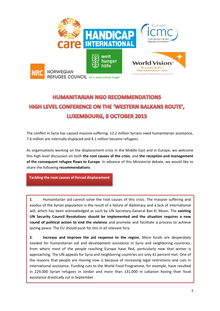 As another high-level EU migration meeting convenes on October 8, the organisations – CARE International, Norwegian Refugee Council (NRC), Welthungerhilfe, International Catholic Migration Committee (ICMC), and World Vision – called for a common and comprehensive approach that addresses root causes of displacement and prioritizes human rights. (23.04.2015) Just a couple of hours ago we received the terrible news that our dear colleague Giovanni LoPorto, who had been taken hostage almost three years ago, is dead. He was killed already in January as collateral victim in what the White House calls an "antiterrorist operation" in the frontier between Pakistan and Afghanistan. 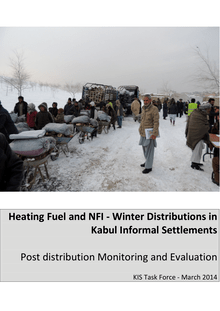 This report presents the results of a post-distribution monitoring survey that was conducted between 2 and 9 March 2015 to assess the effectiveness of winter assistance provided by six organisations (ADRA, DRC, Islamic Relief, VUSAF, Welthungerhilfe, WFP) to 51 Kabul Informal Settlements (KIS) during the winter 2014/2015. 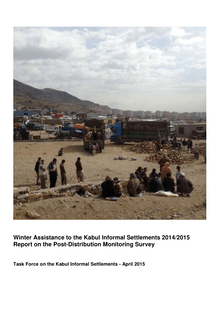 The survey was conducted under the auspices of the Kabul Informal Settlements Task Force. Trends recorded in early 2014 confirm the rising humanitarian needs of Afghans displaced by conflict, natural disasters and man-made disasters: 650,000 Afghans are known to be internally displaced. Forced to leave their homes, IDPs gravitate for protection to urban centres. 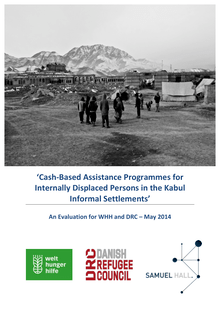 Kabul ranks first in this forced migration scenario: the capital city holds 56% of the urban population with 80% of the population residing in informal settlements. Within this population, IDPs are particularly vulnerable. Bonn, 25.01.2010. In Welthungerhilfe's view, pledges of finance are not crucial to the success of the international conference on Afghanistan in London on the 28th of January. "A 'Cash cure' is not enough by itself", says Wolfgang Jamann, Welthungerhilfe's Secretary General. "Instead, what is needed in Afghanistan is a paradigm shift in terms of the international involvement. On Wednesday, an Afghan Welthungerhilfe employee was fatally injured by a mine. The incident took place at around 09.30 hours local time (07.00 German time) in Takhar province. The agronomist was travelling with several colleagues in two Welthungerhilfe vehicles on the way to study-sites for a rural development project when the first of the two cars was evidently blown up by a booby-trap mine. Bonn, 6th October 2008. Prior to the Bundestag's special session on the German military deployment in Afghanistan, Welthungerhilfe is calling for an increase in resources for the Afghan population. "People in Afghanistan are insecure and disappointed," explains Welthungerhilfe's Secretary General, Hans-Joachim Preuss. "To win people's hearts, living conditions have to improve considerably, above all in rural areas. Bonn, 1st July 2008. Welthungerhilfe is sending out warning signals with regards to the impending drought about to hit northern Afghanistan. Rainfall crucial for sowing failed to come in half of the 34 provinces, while temperatures have soared to 45 degrees since April. People in the provinces of Jowzjan and Faryab, where locals only just got through an extremely harsh winter, are most severely affected. Due to this, supplies are already exhausted and farmers are selling off their livestock because they lack fodder and water to feed them. 'The fields and pastures are empty. Bonn, 11th June 2008 - In the run-up to tomorrow's donor conference in Paris, Welthungerhilfe (German Agro Action) is calling for higher, binding and more effective standards for the allocation and implementation of relief projects in Afghanistan. Bonn/Shebergan, January 31, 2008. For the population of the northern provinces of Afghanistan the situation remains worse, says Welthungerhilfe. For weeks, people in the region have been suffering an unusually long period of severe cold weather. The Afghan authorities responsible for disaster relief have already counted 503 deaths - above all children and old people - from the cold. "The real figure is likely to be far higher, because there is no register of deaths and many areas are still cut off," says Uwe Hermann, Welthungerhilfe's project manager in Jawzjan province. Bonn/Shebergan, 18th January 2008. Welthungerhilfe (German Agro Action) is providing blankets, boots and food for 50,000 Afghans caught in the cold snap in the provinces of Jowzjan and Takhar. Since early January, provinces north of the Hindu Kush have been badly hit by an unusually long cold spell and exceptionally heavy snowfall. The German Foreign Office is supplying more than 90% of the total sum of half a million euros being released for relief measures. Bonn, 21st May 2007. Deutsche Welthungerhilfe (German Agro Action) has decided to adopt a change of strategy in its project work in Afghanistan. The relief agency's board of directors reached this conclusion during talks at the weekend. The full details of changes aimed at ensuring the independence and neutrality of the agency's development aid policies will be worked out in a concept by October 2007. "Afghanistan's central government is simply not present in rural regions,"explained Welthungerhilfe's Secretary General, Hans-Joachim Preu=DF. Bonn, 30th April 2007 - An Afghan member of Welthungerhilfe's (German Agro Action) staff was shot dead near the town of Kunduz early on Sunday evening. The member of staff was driving one of two HGV trucks returning from a building site. It seems that the two vehicles came under sudden fire on their way back. The truck at the front of the two vehicle convoy was able to continue its journey and escape. The second vehicle, however, was forced to come to a standstill. The driver was coerced into descending and, according to initial sources, he was shot five times. (Bonn, 26th March 2007.) Following the death of a member of Welthungerhilfe's staff two weeks ago in Afghanistan, the relief organisation is now ready to resume work on its development projects in the country. The German aid worker, Dieter Rübling, was shot dead in Saripul on 8th March. "We're not going to leave the poor and needy in Afghanistan in the lurch," declared Welthungerhilfe's Secretary General, Hans-Joachim Preuss. However, Welthungerhilfe (German Agro Action) will draw its projects in Saripul to a close in May and pass them on to other organisations. Bonn, 8th März 2007 - A German member of Deutsche Welthungerhilfe's staff was attacked and shot dead in northern Afghanistan this morning. The employee, who was travelling in two vehicles through the Sar-i-Pul region with local colleagues, was stopped by two armed men at 12:30pm German time. The armed men hurled abused at the local employees, insulting them for working for a foreign organisation. They were then sent off. According to a statement given later by the local employees, shots then rang out. Bonn, 30th January 2007. On the occasion of the current conference in Berlin regarding the rebuilding of Afghanistan, Deutsche Welthungerhilfe (German Agro Action) has highlighted the disastrous situation of the Afghan rural population. More than two thirds of Afghans live in villages or small provincial towns. Around 80 % of this rural population survives on less than one dollar a day. Only one in five people have access to clean water. Contaminated drinking water is the most common cause of child mortality. Peace has still not come to Afghanistan. With progress being made only very slowly in the country, dissatisfaction amongst the population is spreading. The anti-governmental elements (AGEs) are gaining influence. These are not just Taliban forces but followers of militia groups, warlords, drug dealers and criminals.